Great Mosque or Masjid Agung Semarang Central Java is a mosque located in the city of Semarang, Central Java province, Indonesia. This mosque was built in 2001 until 2006. This mosque stands on 10 hectares of land. Grand Mosque was inaugurated by Indonesian President Susilo Bambang Yudhoyono on November 14, 2006. 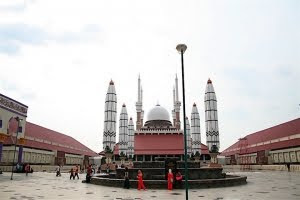 Great Mosque of Central Java (MAJT) which was built in 2001 to 2006 is located in East Semarang area, precisely located at Jalan Gajah Semarang. Majestic mosques and spectacular stands on 10 hectares of land and has very complete facilities, such as the convention hall (auditorium), souvenir shop, Pujasera, office buildings, libraries, and the tower of view. Mosque was built about five years time this building was left of the ideals and aspirations of the main Mosque of Central Java (MAJT) able to control social and economic life that tends to promote worldliness. Overall this mosque construction cost of 198,692,340,000 IDR. Grand Mosque was inaugurated by President Susilo Bambang Yudhoyono on about 14 November 2006 by pressing the sirens and the signing of a replica plaque. While the original inscription had been installed permanently in the front yard entry level 3.2 meterdengan Mosque weight 7.8 tons, is a natural stone taken from the slopes of Mount Merapi, Magelang regency, Central Java. This inscription carved Nyoman M. Alim is also believed to create a miniature temple of Borobudur is located in Minimundus Vienna Austria in 2001. 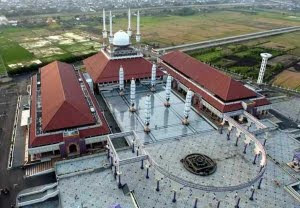 Central Java Grand Mosque was built in the area of approximately 10 hectares, with an area covering the main building 7.669M2, and can accommodate 6000 pilgrims. 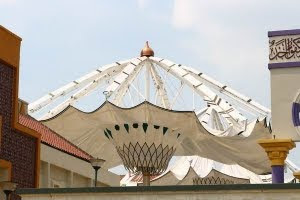 Court was equipped with an area of 7500 M2 giant umbrella 6 who can open and close automatically as in the Nabawi Mosque in Medina, able to accommodate 10 thousand worshipers. This mosque architecture is a blend of Javanese architecture, Arabic and Greek. On the right wing is Convention Hall or auditorium that can accommodate 2000 pilgrims, were left wing is prepared to library separately later in the design of a modern library (digital library); and office space for rent. Great Mosque of Central Java but is prepared as a place of worship, was also prepared as an object of religious tourism. To support these goals, the Great Mosque is equipped with a guesthouse with a capacity of 23 rooms in many kind of class, so that the pilgrims who want to spend the night can take advantage of the facility. Another attraction of this mosque is Al-Husna Tower or Al Husna Tower 99 Meters height. 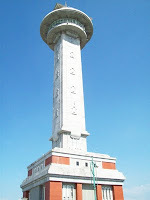 The bases of the tower have Da’Is Radio Studio (Islamic Da'wah). While on the 2nd floor and 3rd floor used as the Museum of Islamic culture and on the floor there is Cafe 18 Muslims who can spin 360 degrees. On the 19th floor is equipped for tower view 5 binoculars that can see the city of Semarang. For the purposes of worship, mosque architecture of universal and local fusion was able to accommodate 10 thousand worshipers. Inside the mosque is complex there guesthouse with 23 rooms in various classes. This homestead provision aims to provide lodging facilities for pilgrims or religious tourists who want to spend the night in MAJT. 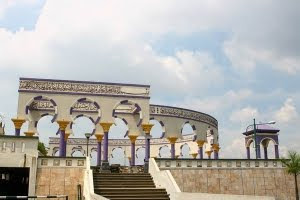 For those who want recreation, MAJT also provides some entertainment facilities, such as play equipment and train a rabbit that will take visitors around the mosque complex. Hey! You some kind of pro? Great message. Can you tell me the way to subscribe your weblog? it appears to be taking perpetually to come back up. I visit from work, and our connection there may be pretty good. Do you suppose the problem could possibly be in your end?